Channel surfing is a popular way of watching TV. You pick up the remote, lean back, and flip through channels to see what’s on. On Android TV, app developers can create their own channel-like experiences using the TV Input Framework. To the user, the channels you create look and feel just like regular TV channel. But behind the scenes, they stream video over the internet. For example, you can create a channel from a video playlist. Watch this DevByte for an overview of how to build to a channel, and see the sample app and developer training for more info. The sample shows how to work with a variety of media formats, including HLS, MPEG-Dash, and HTTP Progressive. If you already have an app that streams video, consider also making your content available as a channel. It’s a great opportunity to increase engagement. We’re excited to see what you develop, and look forward to seeing your content on the big screen! We’re excited to see the launch of Nexus Player, the first consumer streaming media player running Android TV. 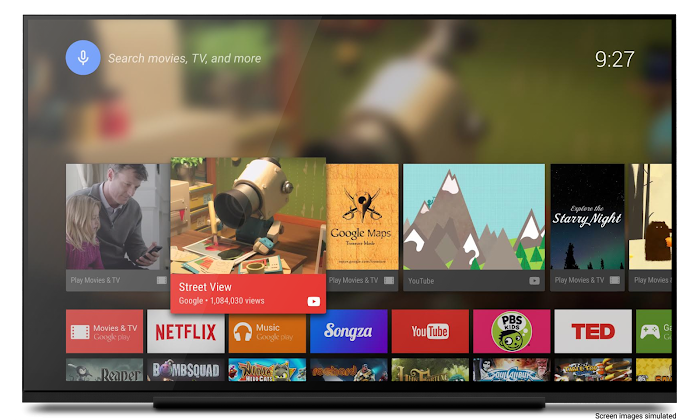 Android TV delivers an entertainment experience tailored for users, including movies, shows, games and more. Now is a great time to develop apps for Android TV that reach a whole new audience. Starting today, you can publish your apps for Android TV on Google Play, the largest digital store for apps and games. We’ve provided guidance on how to get started building great apps for Android TV in this post. "Google has done an insanely good job to ease the developer’s task of creating a TV application, mainly thanks to the Leanback support library. It literally takes 2 hours to create a fully working and possibly fancy app, which is awesome." We want to offer the best possible experience for users to enjoy your apps and games. To make this possible, your Android TV app must meet the basic requirements for usability. When your app meets these requirements, users will be able to discover and download it directly on their Android TV devices. Even if you have already uploaded your app to the Google Play Developer Console, you will need to add TV graphics and screenshots, and opt-in to distribution on TV on the Pricing & Distribution page. For complete information about the requirements and process of publishing your Android TV app for Google Play, make sure to check out the publishing documentation. With our Leanback Library we’ve made it easy for you to extend your existing app to the TV screen or even build a completely new app for Android TV. For a quick look at the Leanback Library, check out this DevBytes video. We’ve only begun scratching the surface of what’s possible with this new form factor, and we are very excited to see what you will build, start developing today!